Signed by the author - extremely rare. Please note, these are not perfect copies, and may carry some creases or other defects. Synopsis : Cat Ward is a bored, unhappy teacher in B Smith's school. On the day of the zombie apocalypse, she does anything she can to escape, and actually starts to enjoy life more in the following days and weeks than she ever did before. But somebody has an eye on her... somebody who is intrigued by her ruthlesness... The circus has come to town. The ringmaster is calling the shots. But what does he want with Cat Ward?!? A short, additional book, not part of the main storyline, though it does tie in with it. Best read between books 4 and 8 of the series. 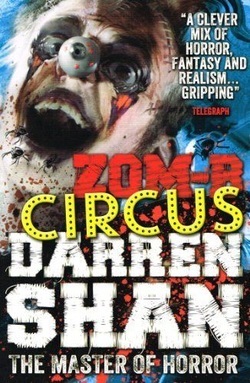 Author Notes: I started Zom-B Circus in July 2013, and finished work on it in February 2014, one of the shortest periods I've ever spent working on a published book. My publishers wanted to pitch a short Zom-B book to the organisers of World Book Day, and asked me if I had any ideas. It wasn't something I'd thought about before, but I put my thinking cap on and came up with this surreal little gem. I thought it would be fun to tell a story that didn't revolve around B Smith, that let us see what some of the living survivors had got up to while we were focusing on B's story. Once I had the idea in mind, I ploughed ahead and wrote the short book as soon as I could, even before we had heard back from the WBD folk about whether or not they actually wanted to include the book in their lineup. As it turned out, they didn't! My publishers pitched them the plot of the book, and they turned it down without even waiting to read the finished novella. They said it was because it was too dark for their target audience, which surprised me a lot several months later, when Lord Loss was listed among their Top 50 Children's Books of all time! For me, World Book Day should include teenagers as well as younger readers, but apparently the current WBD crew don't share my view. Oh well, I'll bear that in mind should they ever approach me in the future -- I have a nice long memory for things like that! The rejection by WBD threw up something of a problem -- what could we do with the book? I was determined to release it, as I thought it was a really neat story. I would have liked to release it as an unofficial World Book Day title, in direct competition with the official WBD list, but my publishers were wary of doing that, as they didn't want to upset the WBD team -- unlike me, they'll have to work with them again in the future. In the end, after much discussion, we decided to release it mainly as an eBook, but also to make a physical version which we would give away free with SFX magazine (who were great in their support for the project) and via Easons in Ireland. It has also been picked up for release by my American and Canadian publishers as an eBook, and hopefully other countries will follow suit too in the future. The main character, Cat Ward, was actually named after my publicist at Simon & Schuster, Catherine Ward! I get on very well with Catherine -- she was also one of my publicists at HarperCollins years ago -- so I was a bit wary of naming such an unpleasant character after her, but luckily she was delighted to get the nod! I also named the Bearman family after real people -- Jules works for my agent, Paul is her husband and George is her son. And the mutant Claudia is named after Jules' daughter. Although Cat's story isn't part of the main storyline, I was keen to have it tie in with B's story in certain key ways. So we get to see some of the characters from the series -- B, Mr Dowling and Kinslow are obvious additions from the Zom-B books, but there are some lesser players in among the mix too, and some of the characters and artifcacts from this book will also crop up in the books in the second half of the series, so watch out for them! I'm really pleased with the way Zom-B Circus turned out. While it's not absolutely essential, I think it's a good addition to the series, and I'd recommend fans check it out if they want to get the FULL story. Of course, the only difficulty for me now is, do I describe my Zom-B series as being 12 or 13 books in length?! ?